Many people forget that it is important to add their City/State/County on their website. 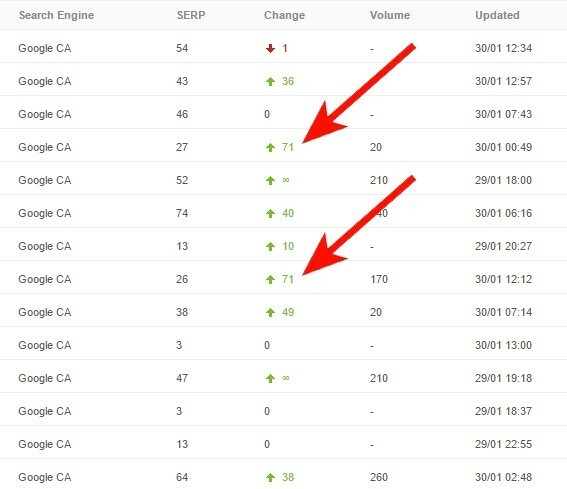 This is a simple technique that tells Google that you are local to the city that the user is searching from and you can see some significant jumps in both organic and local searches by doing so. The below diagram shows an example of a website that jumps (as much as 7 pages) by simply adding this very simple piece of information to their website title tag. This change took less than 5 minutes to implement and has yielded dramatic results. While this may not necessarily produce the same drastic results in every case, it will almost certainly offer an increase in the local SERPs as the search engines will now know that your business is local to that area when users search for your services locally. It is crucial to remember that although it is important that this information is within your content, it’s also of equal consequence not to stuff your content with keywords! Google’s algorithms are becoming smarter! This means that not only can the algorithms detect an attempt to manipulate a site’s ranking in the SERP’s by repeating keywords or phrases, it can also derive meaning from these sentences/phrases meaning that if your content is stuffed with keywords that don’t make sense, your sites ranking may suffer. The best advice is to focus on creating quality, information-rich content that uses keywords appropriately and only add your locality as necessary to drive relevancy signals. Need help with your Local SEO? Get in touch with us now.